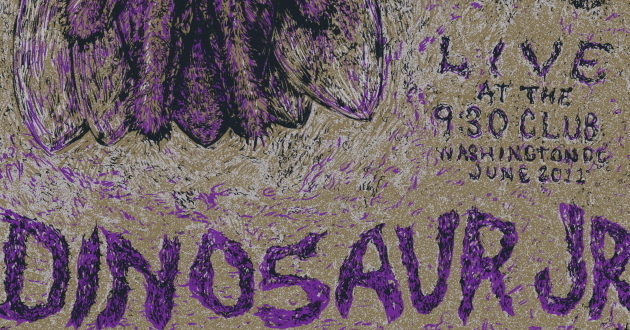 >> Remember earlier this spring when we reviewed the DVD "Dinosaur Jr. Bug Live at 9:30 Club, In The Hands Of The Fans?" Well, it happened; here's the link. But in case you were having trouble getting that DVD to play on your turntable, new label Outer Battery, which also released the album from the old J Mascis side-project Heavy Blanket, is releasing July 10 the audio of the show on limited edition vinyl under the title Bug: Live. 200 copies of the record are being pressed to purple vinyl, and pre-orders are being taken right here. The content and character of the collection is self-self-explanatory. We hear the LP, exclusively mastered for release on vinyl of course, includes the entire show save for some of the cataclysmic closer "Don't," which was edited to get the show to fit on a single disc. And what about new music from Dinosaur? According to this recent report at SPIN, a new record from the legendary indie rock trio is tentatively set for release by Jagjaguwar in August. If you've been watching bassist Lou Barlow's Twitter feed, you know the record is recorded and mixed; there will be two Lou songs on the record and another used as a b-side; and recording and mixing ended last week after 85 days (although not all 85 of those days were days worked on the album, Barlow points out). So two things Dinosaur-related to look forward to. >> Faithful fans of Philly-based post-punk goliath Lefty's Deceiver received a bolt from the blue yesterday in the form of this brief Facebook status: "Mixing demos of the new songs as we prepare to record a new record! #LD2012" Of course, there's nothing explicit here about WHEN such a record is going to be finished and released, but isn't it some comfort to know that the gears are turning? Any new album would be the first since Lefty's Deceivers' triumphant third full-length Cheats, which we reviewed for Junkmedia right here in 2003. There's no word whether the new collection would be released on the now-mothballed My Pal God label, which along with Cheats also released the electrifying Process Jr. EP in 2001. But if any of the new material comes even close to approximating the cataclysmic triumph of this recent live version of "Iselin," some label boss somewhere is going to be very, very happy. And, you know, fans. Stream selections from the band's catalogue via the embed below, which features music from a digital comp, LD 101, the band put together recently. >> If you are not yet into the habit of checking into the Midriff Records blog, let's correct that right now. Particularly because today Midriff is offering an exclusive download of Eldridge Rodriguez covering RIDE's "Vapour Trail" ... wait for it... in SPANISH. An outtake from Clicky Clicky's NOFUCKINGWHERE compilation released two weeks ago today, the Spanish "Vapour Trail" touts the same brilliant instrumental work topped by an alternate vocal take. You want this, and you can get it right here, lodged among some verbiage that Midriff asked me to write to contextualize the song for its blog readers. All of NOFUCKINGWHERE is still available for free download right here. >> If the scamps in Oxford, England-based futurepop sextet Screaming Maldini can be believed, the band's debut full length, not title yet disclosed, will be issued by Alcopop! Records June 18. Or maybe that is the release date for a new single to support the release of said LP. We don't know! Write more specific Facebook statuses, everyone!